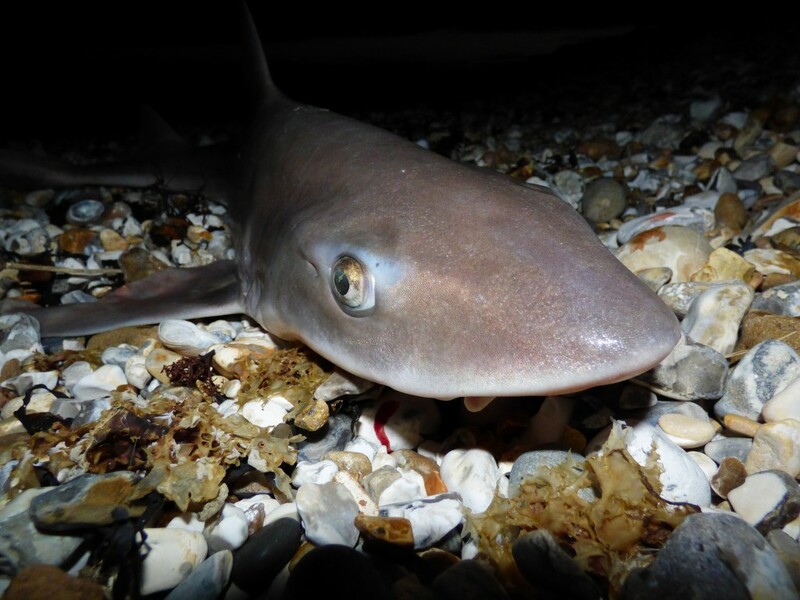 Smoothound’s are a shallow water species and so being either on the South Coast or the West of the UK, having lots of shallow coastlines, we are lucky enough to be in the most common areas where they are caught. 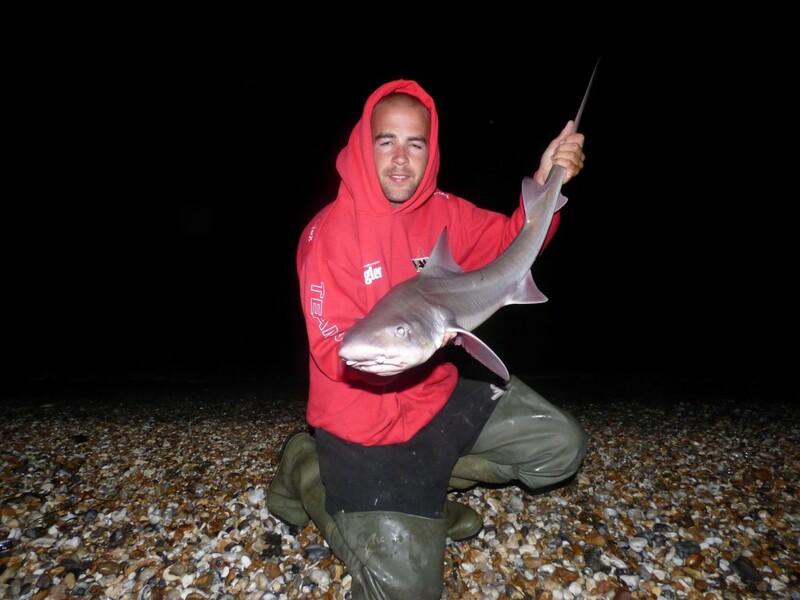 However with more and more anglers catching and releasing these shark like fish, their range is increasing. They are around in good numbers as far North as the Humber Estuary on the East Coast, and in lesser numbers on marks such as Kirkcudbright in South West Scotland. You would think that being a member of the shark family that they would primarily hunt for fish to feed on but instead they scour the seabed in search of crabs, shellfish and even hermit crabs. They use their crushing plate in their mouths to crush their food which is hard to imagine as sharks tend to have big sharp teeth making the Smoothound quite a unique family member. 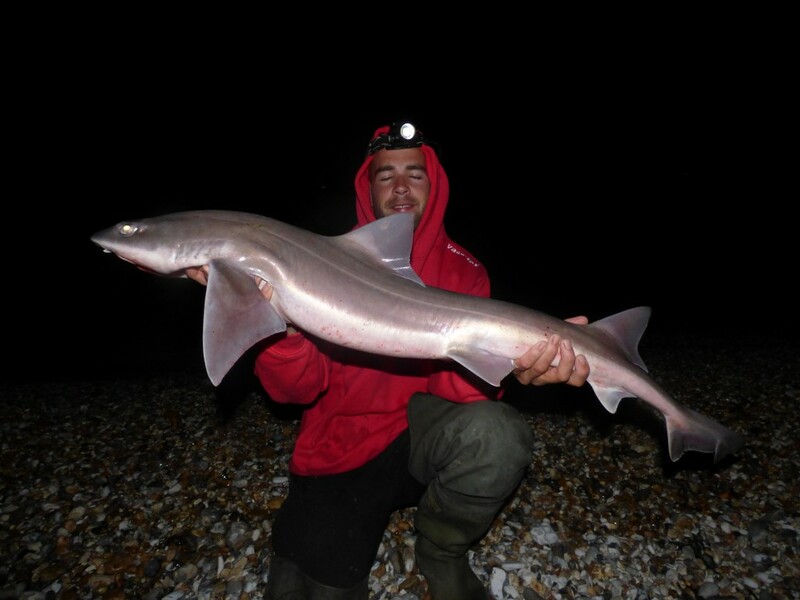 Smoothound like to hunt on clean or mixed ground, with a good tidal flow. It is rare that they are caught on rocky marks. Last Sunday (14th June) the conditions looked absolutely perfect for fishing for the hounds. 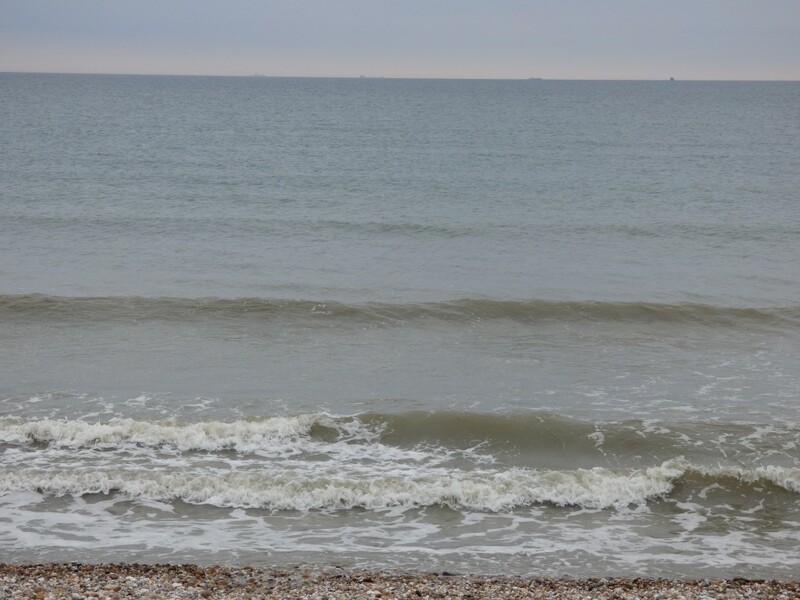 The sea was flat and the weather was calm. Both factors are extremely important when on the hunt for these majestic creatures, as they come into the shallows in search for food making them easier to target as they will be within many peoples casting range. Around 2pm I joined two of my friends on a local mark at Bracklesham beach in West Sussex. The tide was ideal as low water was around 4pm making the high at 10.20pm. I decided to try lighter set up by using my Iridium continental rod which is fantastic sport on the bigger fish. I took with me my Shimano fixed spool reel lined with 20lb braid with a 50lb mono tapered shock leader. I was lucky enough to have some frozen peeler crabs saved for me at Hookers Baits however other baits that can be successful are Squid and Ragworm. Believe it or not hardback crabs are also worth taking as they are a natural food source for the hounds. Rigs only need to be simple, I like to use a clipped down Pulley rig with size 4/0 or 5/0 long shank hooks. By clipping the rig down you will get extra distance if you need it, and it stops the rig tangling on the leader during a cast. When you are fishing for such strong fish your terminal tackle needs to be up the task. Good quality hooks such as a 4/0 Sakuma, or a Cox & Rawle crab hook, form part of my pulley rig. As the tide began to flood we started to catch some smaller hound pups, we were very pleased to see these show as it was a good sign that the bigger ones could appear once dark came. We were right. As soon as darkness was upon us and especially over high water, we began to catch bigger fish. I had 9 fish in total during the course of the evening with my biggest being 14lb 7oz which I was over the moon with. 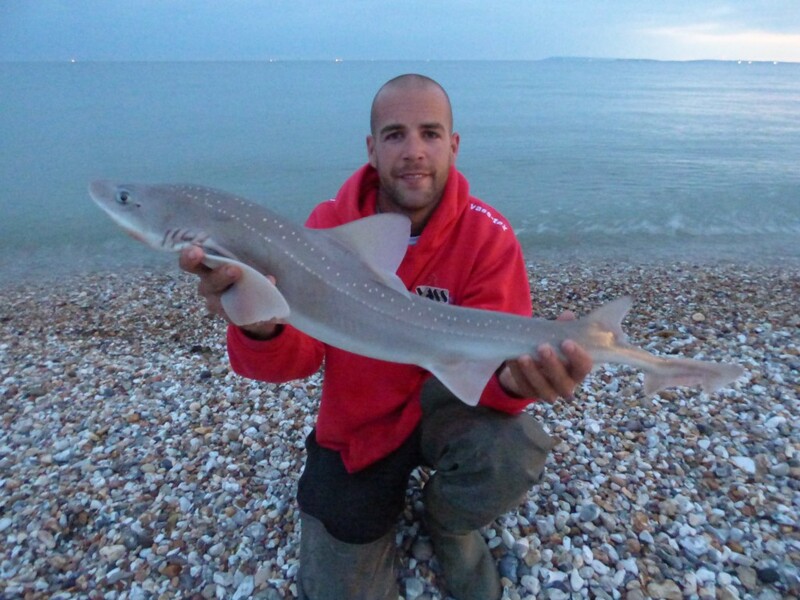 The British Record is 20lb 3oz from the shore, however bigger fish have been caught but not used as records, solely down to the fact that fisherman do not want to submit a dead fish for verification of weight, when they are classed as such a great sporting fish and they provide a good bend in a rod after the winter period of Rockling and Whiting fest during the winter months. There is currently an ongoing debate regarding the two different species of hound around the UK. The ‘Common’ hound as we all recognise as being grey all over and the ‘Stary’ hound which has small white spots or ‘stars’ scattered over its back. The size limit on the hounds is 51cm which is very useful to know, however not many people tend to keep them as not only are they a fantastic sport fish but they are extremely bony to eat. Smoothounds are a fantastic sport fish, they put up a great fight when hooked and nowadays more and more anglers catch and release which is proving to be a positive move for stock balances. All of the fish we caught, we photographed them and returned them, making sure that when they come out of the water we took care to hold them carefully. One hand on the tail and the other under its belly. The main reason for this is because they have a very delicate internal system and if you handle them incorrectly, for example if you pull them up the beach by their tail you can dislodge the stomach and other organs which can injure and even kill the fish. On returning the fish always make sure it is as far away from the beach as possible as they tend to follow the headtorch lights and then become beached. 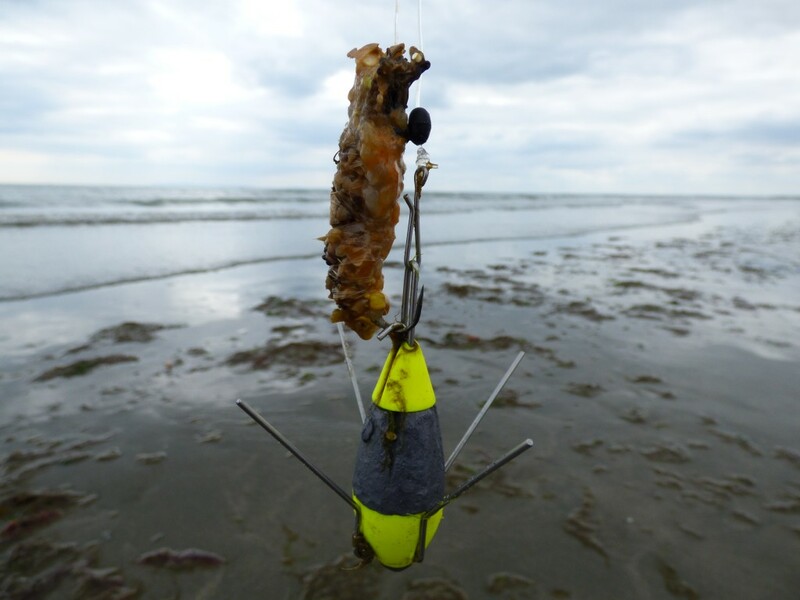 The thing I like about Smoothound fishing is that once they turn up on the local beaches they are easily accessible to anyone, meaning you don’t have to be a distance caster and simple rigs will catch them. Well worth giving it a try to help introduce people into the thrill of sea fishing for such a sporting fish and the fight of your life. One Response to "How and where to catch Smoothound"